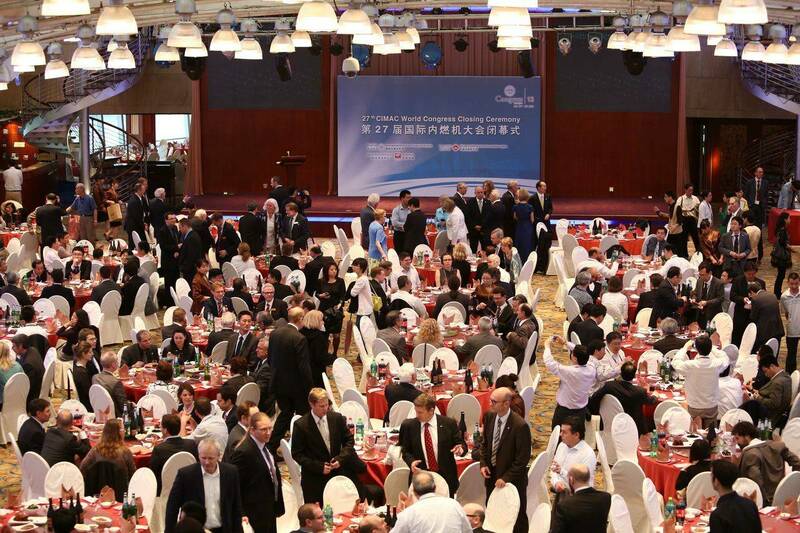 The CIMAC World Congress on Combustion Engine Technology for Ship Propulsion, Power Generation and Rail Traction was held from May 13-16 in Shanghai. The Technical Program of this CIMAC Congress reflected a host of current hot topics, such as CO2 reduction or emissions. It consisted of 193 paper presentations, flanked by 68 poster presentations, from 20 countries – with strong participation from China. The huge amount of technical contributions was based on more than 400 abstracts which have been submitted to CIMAC in preparation of the congress, more than ever before. In total, 889 participants from 33 countries attended the technical sessions, which was as usual accompanied by an exhibition of 2,642 sqm net space, with 82 exhibiting companies from all over the world. "This year's Congress was once again a meeting of all the major players from the engine community and offered extraordinary opportunities for networking with participants from all over the world," said Axel Kettmann, CIMAC's Vice-President Communication. The choice of China as the host country for the congress reflected the dynamism of the Chinese market for engines and their applications. It was the second Congress in China, the first one having taken place more than 20 years ago. Highlights of the congress included the opening ceremony with a sand-painting performance illustrating the venues and history of the previous CIMAC Congresses, followed by a keynote speech by Prof. Su Wanhua on Development of High Efficiency and Low Emissions Diesel Combustion Technology in China. On Tuesday evening, the ABB evening took place at a very special venue with spectacular performances. On Thursday the technical sessions ended with the Collin Trust Lecture by Prof. Dr. Li Jinghai on Future Energy and Enabling Science & Technology, followed by a final panel discussion on Large Bore Engines in the Light of Changing Fuels chaired by Karl Wojik, AVL List GmbH, Austria, with panelists from DNV Singapore, NSB Niederelbe (Germany), GE Transportation (USA), Shell Netherlands, MAN Denmark and Wärtsilä Italy. The paper awards were disclosed at the gala dinner on Thursday evening. The President's Award was given to L. Vervaeke and T. Berckmoos, Anglo Belgian Corporation, Belgium and S. Verhelst, University of Ghent, Belgium, for their paper No. 88: The CRISTAL Engine: ABC's New Medium Speed Diesel Engine, Developed to Comply with IMO III. The Best Paper Award went to I. Calvert and A. Zucchelli, GE Jenbacher, Austria, and B. McCully and M. Krajicek, Ricardo, U.K., for their paper No. 419: Integrated Design, Analysis & Development Processes Applied to the Design of a High Specific Output Gas Engine Cylinder Head.